The spectacular abode of dense forests, snow-covered peaks, deep river valleys and cascading waterfalls, Himachal Pradesh is a live dreamland for nature lovers. On our Shimla Best Tourist Circle Tour package, you can behold heritage buildings, quaint cafés and charming iron lamp posts that have a beautiful story to tell. Holiday Travels has designed this package around the most awaited destinations that include Kasauli, Shimla, Kufri Chail and Parwanoo. Besides snow-clad peaks and lush green hills, Shimla exudes a strong colonial vibe, as it used to be the summer capital of British India. Visit the major tourist attractions of Shimla, such as The Ridge, Jhakoo Temple, Daranghati Sanctuary and Chadwick Falls. Curl up in front of a crackling fire with a book while the snow slowly touches the ground in blissful destinations like Kasauli and Parwanoo. You may visit the very famous markets in Shimla and Kasauli to discover new cuisines and buy souvenirs. Experience the scenic beauty of Himalayan ranges and grab the opportunity to indulge in Himalayan delicacies. This Kasauli-Shimla-Chail-Parwanoo holiday package also lets you partake in a number of adrenalin-pumping activities like rafting, paragliding, trekking and skiing. What is unique in Shimla Best Tourist Circle Tour package and why? Covers all best destinations around Shimla, Shimla Best Tourist Circle Tour package is unique blend package where you can find royal experience scenic beauty of Himalayan ranges and chance to grab the opportunity to indulge in adventure activities. In this package we takes you to village for provide calm and scenic real beauty of nature. Provide good accommodation, guide where to eat and arrange proper guide for you. Day 1: we Transfer you to Kasauli,305 kms from delhi,check in at the hotel & explore the city, relax and enjoy its alpine like forests,Mall road,enjoy eating out and shopping. while in Kasauli, enjoy the lavish Victorian buildings constructed by the Britishers who resided here decades back. Today, visit and witness all the beautiful tourist attractions in Kasauli.First, visit the Monkey Point and capture the bird's eye view of the nearby cities of Kalka, Chandigarh and Panchkula. Besides, the mighty river Sutlej can also be spotted coursing its way through the mountains. This place is always crowded with monkeys. The top of the hill is shaped like a foot and mythological stories state that Lord Hanuman stepped a foot here. Hence, a small temple is also built on top of the hill. Next, you can visit the Christ and the Baptist Church. Built by Britishers in 1923, the architecture of this Church is inspired by a blend of Victorian and Indian and styles. Head to the next destination on your Shimla - Kasauli – Chail- Parwanoo tour package. After covering a distance of 75 kms from Kasauli, you will reach Shimla. After spending an ecstatic day, drive back to the hotel for overnight stay. After an early breakfast, set out to enjoy a toy train ride from Shimla to Shogi just 22 kms away to give you glimpse of Heritage Toy Train. Arguably one of the most picturesque train routes in the world, the tracks are laid on a narrow gauge and the train passes through more than a hundred tunnels until it finally reaches Kalka. Next, visit The Ridge in the evening, the most popular sightseeing place in Shimla. It is a wide open street located on the side of Shimla’s mall road. It is a market place and also the social hub of the town. The road is lined with bars, cafes, boutiques, shops and restaurants that attract thousands of travellers. You can also visit the Lakkar Bazaar and shop for wooden artefacts or opt for ice skating in India’s only open roller skating rink. Head back to the hotel for good night’s sleep. After breakfast and move out for a day’s excursion to Chail on your fifth day of Shimla Best Tourist Circle Tour package. Known for the heritage hotel, Chail Palace and the world's highest cricket ground, this destination is a calm hill station set in the midst of deodar and pine trees.move to Chail Wildlife Sanctuary.Later, visit the Kali ka Tibba, a temple dedicated to Goddess Kali. Enjoy the breath taking scenery of Shivalik Range and Choor Chandni from the temple. Drive back and spend the night at the hotel in Shimla. After breakfast, check out from the hotel in Shimla and drive 85 kms to reach Parwanoo. Once you check in at the hotel, head out to explore this town which is situated on the border of Himachal Pradesh and Haryana.First, head to the Timber Trail, enjoy cable car ride is among the most amazing things to do in Parwanoo as the ride offers some alluring and spellbinding views.Next, visit the Gorkha Fort, a famous sightseeing place in Parwanoo. Stay in Parwanoo, Timber Trail for good night’s sleep. Post breakfast; prepare for check out from the hotel and drive to Delhi airport where you take your flight back home. We hope that this holiday tour would have enthralled you and you made memories worth a lifetime. Personal expenses like laundry, telephone, tips, etc. After landing in the capital city of India, drive down 305 kms to reach the mystic town of Kasauli. Once you check in at the hotel and have lunch, head out to explore the city. Nestled amidst beautiful woody forests of cedar and pine trees is the Mall road. For an otherwise calm Kasauli, this is a much loved exception and one must not miss this colourful hustle bustle of the town. This place is a must visit place in Kasauli and provides flattering options for eating out and shopping. While taking a stroll at the Mall road, behold its mystical and serene ambience and notice the lavish Victorian buildings constructed by the Britishers who resided here decades back. Once you have bought the very famous warm shawls, handicrafts and unique artefacts, head back to the hotel for overnight stay. Begin your second day of the Shimla - Kasauli – Chail- Parwanoo package tour with a healthy lip smacking breakfast. Head out to explore this cosy little hill-station. Kasauli makes for an ideal and peaceful holiday location since it is a hilly cantonment town set away from the rush. Today, visit and witness all the beautiful tourist attractions in Kasauli. First, visit the Monkey Point and capture the bird's eye view of the nearby cities of Kalka, Chandigarh and Panchkula. Besides, the mighty river Sutlej can also be spotted coursing its way through the mountains. This place is always crowded with monkeys. The top of the hill is shaped like a foot and mythological stories state that Lord Hanuman stepped a foot here. Hence, a small temple is also built on top of the hill. Head back to the hotel for overnight stay. Once you have had a scrumptious breakfast, check out and head to the next destination on your Shimla - Kasauli – Chail- Parwanoo tour package. After covering a distance of 75 kms from Kasauli, you will reach the quaint town of Shimla. Shimla is a picturesque hill station with a rich colonial history. Being the most popular hill station in northern India, there are a lot of amazing places in Shimla that you can traverse. On arrival, check in and head out to visit the Jhakoo temple. Housing the world's largest Hanuman statue, the temple also gives its visitors a panoramic view of the town of Sanjauli and the Shivalik ranges. Later, visit the Viceregal Lodge, also known as the Rashtrapati Niwas. It is located on the Observatory Hills of Shimla and was formerly the residence of the British Viceroy of India. After an early breakfast, set out to enjoy a toy train ride from Shimla to Shogi to enjoy the heritage Train ride located at 22 kms away, this train ride we have specially included in package to give you glimpses of the remarkable engineering and beauty. Drop at Shogi and have lunch. Arguably one of the most picturesque train routes in the world, the tracks are laid on a narrow gauge and the train passes through more than a hundred tunnels until it finally reaches Kalka. If you hop on this ride, you will be crossing a path which is a declared World Heritage Site. Move back from Shogi to Shimla by our car, driver will be waiting for you..
Have a quick breakfast and move out for a day’s excursion to Chail on your fifth day of Shimla Best Tourist Circle Tour package. Known for the heritage hotel, Chail Palace and the world's highest cricket ground, this destination is a calm hill station set in the midst of deodar and pine trees. Known as a hiker’s paradise, behold the mesmerizing views of the Himalayan valleys from such a great height. Next, make yourself present at the Chail Wildlife Sanctuary. This place has a myriad species of unique animals and birds including the Indian Munjtac, wild boar, leopard and garal among many others. Later, visit the Kali ka Tibba, a temple dedicated to Goddess Kali. Enjoy the breath taking scenery of Shivalik Range and Choor Chandni from the temple. After breakfast, check out from the hotel in Shimla and drive 85 kms to reach Parwanoo. Once you check in at the hotel, head out to explore this town which is situated on the border of Himachal Pradesh and Haryana. First, head to the Timber Trail. The destination is an emerald beauty with its many coniferous and pine trees. Taking a cable car ride is among the most amazing things to do in Parwanoo as the ride offers some alluring and spellbinding views. Next, visit the Gorkha Fort, a famous sightseeing place in Parwanoo. It exhibits strength even today through its ruins. You can also visit the Gurkha Museum nearby to know a little more about the place and take in a spectacular view of dense forest all around. 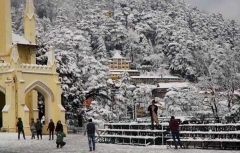 Best time to visit Shimla in March to June: This is a popular tourist season in Shimla as the weather is quite pleasant and perfect for outdoor activities. The temperature is comfortable and usually varies between 15 degree C and 30 degree C. If you are into adventure sports then this is the ideal time to try paragliding, trekking, camping and rafting. Katir: Katir is a popular picnic spot among locals and tourists, Located at a distance of 13 km from Fagu. The site is also a delight for those into photography and simply an ideal escape for those in need of a quiet and relaxed holiday. The place serves as a good base camp for trekkers and naturalists. The picturesque view of the hills and its beauty is really enchanting. Banthia Devta Temple: Banthia Devta Temple is dedicated to a local god of Fagu. Highly revered by the locals, the temple features eye-catching wooden carving, thatched roof, small entrance and pillars. The temple offers an amazing peep into great art and culture of the town. The beautiful wooden carvings in the temple are an awesome sight. After offering prayers at the temple, you can explore the area around the temple. Set amidst surreal and untouched beauty, the area is a real treat for nature lovers. Theog town: Basa Theog village is located in Theog Tehsil of Shimla district in Himachal Pradesh. Theog town (10 Km) is a wonderful small town well known for its markets. The feature which adds charm to its beauty is that the panoramic view of the hills. Fagu is small part of Himachal Pradesh where you cannot find any Restaurant to eat and drink out. The best option to eat in Fagu is the restaurant of the hotel where you are staying. Jalori Pass: 90 km from Narkanda, passing through the Sutlej Valley and crossing over to Luhri, Ani, Khanag through one of the best scenery in the Kullu Valley takes you to Jallori Pass. A 30 minute level walk from the Pass takes you to Sarolsar Lake among deep forests. See nature at it's best.